"These pancakes are fun and easy, especially for kids. The fruit in the pancakes go well with maple syrup. Whenever I make these, I never have any leftovers. Serve hot with maple syrup or fresh strawberries." Preheat oven to 350 degrees F (175 degrees C). Coat two non-stick baking sheets with cooking spray. Sift together the flour, sugar, baking soda, and salt. Gradually beat the flour mixture into the egg whites to form a batter. Evenly fold the fruit cocktail into the batter. Dollop the batter in 2 tablespoon portions onto the prepared baking pans, leaving at least 2 inches between pancakes. Bake in preheated oven until puffed and golden brown, 10 to 15 minutes. 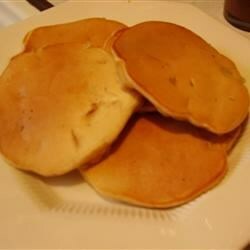 Easy pancake recipe, I like it and thank you for posting.